Heres my opinons on the newest sk8 videos out. This was a good movie in the respect that it wasint all about skateing,but the REASON why these people persist in what they do,through all the pain they go through.Its really a amazing film.I thought that the sk8ing as well was something to marvel at. 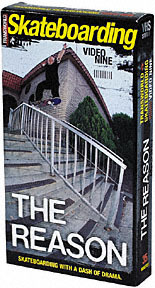 Yea this movie was awesome.At the begining when you watch rodney do his old school freesyleing you just about pee your pants.The first 5 minutes is enough to buy the movie.Then daewon comes in later, his 360 flips to blunt slides is awesome,but can get rather redundant.Also a lot of other skaters are featured in this film too. DO NOT GET THIS MOVIE!! Oh my god this movie was a bum out,all the pros that were suposed to teach you tricks seem as if thy would much rather be doing something else then being in the film.They all seemed angry that thy had to give trick tips to people who coulnt do what they do, it was stupid.